It took Microsoft long 4 years to launch Office for iPads; and taking into account that Microsoft Word, PowerPoint, Excel and OneNote have quickly become the top free apps for the iPad; it is absolutely evident that the demand for these services was critical. Of course, it did help a lot when Microsoft wisely made these applications free, but with some limited functionality, so anyone can install them and read Office 365 files. Nevertheless, to be able to actually create and edit documents, you will need a subscription, and there is no apparent statistics as to how many people have acquired Office 365 ever since the iPad apps launch. Each application has gained stellar reviews so far. 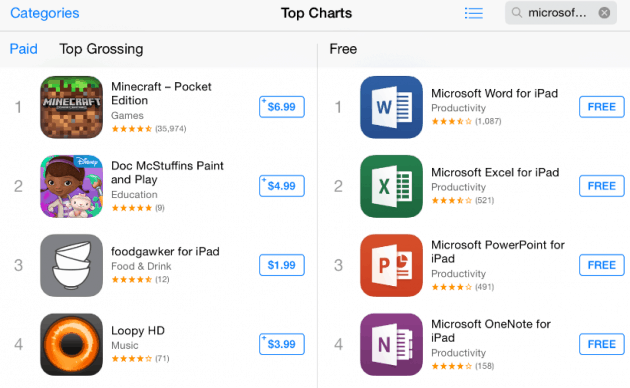 As far as iTunes App Store is concerned, Word for iPad has gained a 3.5 star rating with over 1000 reviews, while Excel boasts a similar rating and PowerPoint has gained 4 stars. These applications’ in-app purchases offer the Office 365 home subscription for $99.99, and Microsoft agreed to give Apple 30% discount. Many argue that it would’ve been nice to be able to buy only a standalone application without subscription to Office 365 home. Many people only need Word and never use PowerPoint, so, a lot of users will never want to purchase a subscription at this rate. We have yet to see how long the Office stays on top of free applications on iTunes. There is a chance people will get disappointed when they find out they can only open and read Office documents for free, while the rest of the functionality is available at $100 price, and we might as well see the apps leave the top chart. Likewise, Microsoft Office for iPad could indeed be a successful product for the iPad despite its price.